There is joy in heaven when a sinner repents and yes their is a smile on our toothless mouths because we have hope of artificial teeth!! Now there is high chance that even number 1 citizen of Nigeria may be locked up with number last. I think I hear the shivers of fear!!! Power in the pocket of the masses, caution!! However, I hope we won’t start hearing people suing the presidency for their malfunctioning toilet, excessive rent or fuel price increase and the likes. If the House of Representatives get their way in the new constitution being drawn up, governors and the president will have their immunity from prosecution while in office withdrawn. This is one of the recommendations contained in the report of the House of Representatives ad-hoc Committee on Review of the 1999 Constitution which is scheduled to be laid on the floor of the House today. According to a member of the committee who declined being named since the report is yet to be debated in the house, the report has also recommended that the current two terms of four years each, in contrast to the Senate’s position which is pushing for a single-six year tenure. 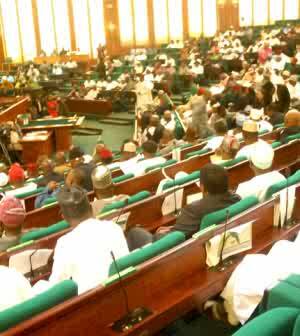 The committee which is headed by the Deputy Speaker of the House, Hon. Emeke Ihedioha also recommended that a definite uniform tenure be provided for all local government officeholders across the country in line with the request of the Nigerian public. One of the reccomendations however stand out as ambiguous ” rotation of the office of the president, scrapping” why should we be talking of rotation of power in a democracy where the constitution allows any Nigerian citizen above age 18 to vote and be voted for, its totally conflicting and akin to Nepotism, some forces working to rid the masses of their power to choose who rules them irrespective of ethnicity, religion or tribe.